What a lovely way to start off 2015! I'm participating in a read-along blog event which is being hosted by Heidi of Literary Adventures Along the Brandywine and the book that we're all reading for this event is Jane Austen's Persuasion. It's a captivating and deeply emotional novel about a love that transcends space, time and war and it's my favourite Jane Austen novel :) This is a very, very recent development though. Pride and Prejudice was my first Jane Austen novel and it was my favourite for almost 10 years but I happened to re-read Persuasion over the Christmas holidays. 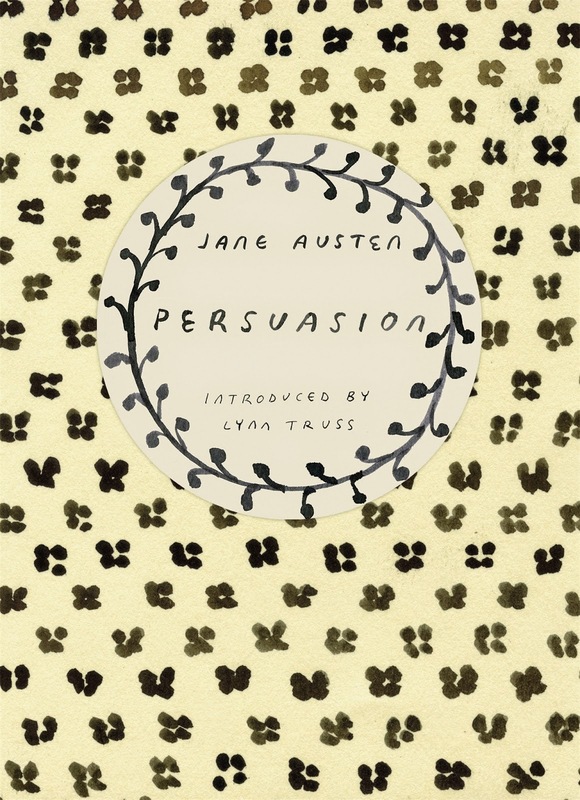 I've always thought very highly of Persuasion but on this occasion I managed to connect with the book in a way that I hadn't fully managed to before. I love, love, love this book! For this post I'm going to summarise Chapter One, talk about some of the things that struck me about it, and provide some of my favourite quotes. I'll be following that format for all of my posts on this book. The aim for this read-along is to do three chapters a week. For this read-along I'm using my brand-new Vintage Classics edition of the book so all of the page numbers that I'll be referring to are going to be from that. If your edition is different to mine then the quotes will probably be on different pages. In Chapter One, Jane Austen basically sets the scene. The chapter begins with Sir Walter Elliot of Kellynch Hall, Somersetshire re-reading his favourite passage in the Baronetage. We quickly learn that Sir Walter is a 54 year old widower and that he has three daughters called Elizabeth (aged 29), Anne (27) and Mary (25). Elizabeth and Anne are both unmarried and still love at home but Mary is married to a man called Charles Musgrove and lives in a village called Uppercross. We then find out that the Elliots are an ancient and noble family who were originally from the north of England (Cheshire) before they settled down south. We also learn that Sir Walter's heir is his nephew Mr Elliot and that Kellynch will be entailed over to Mr Elliot when Sir Walter dies. Austen then provides some information about Elizabeth and tells us that, 10 years previously, Elizabeth courted Mr Elliot in London for a while. He then spurned her for another woman and is rumoured to have said lots of mean things about her and her father. Elizabeth still feels bitter and resentful about this. After that Austen brings us back to the present. Sir Walter's extravagant spending has led to huge debts and if he doesn't retrench soon there's a risk that the family will go bankrupt. The chapter ends with Anne's godmother Lady Russell and Sir Walter's lawyer Mr Shepherd being called out to Kellynch to give some advice on the situation. The heroine in Persuasion is Anne but that isn't very obvious from this chapter. She doesn't appear yet and Austen only provides a brief but tantalising description of her. Austen tells us that Anne has an "elegance of mind and sweetness of character" and that she was once "very pretty" but lost her bloom early (pg.6). But why did Anne lose her bloom early? Did something happen to her? Is that foreshadowing I detect? :) It's interesting that Austen doesn't give us much information about Anne yet. It's probably because Austen wanted to show us how little regarded Anne is but then Pride and Prejudice starts off in a similar way too. That book begins with that famous conversation between Mr and Mrs Bennet about how Netherfield Park is to be let at last. It's really not obvious which of the Bennet girls is going to be the heroine of that story. Chapter one of Persuasion is mostly focused on Sir Walter and Elizabeth and they're horrible. They're vain, self-obsessed snobs who have no affection for Anne or Mary at all. I think Austen depicts them brilliantly. There are times in the book when I just want to slap them for their lack of love and consideration for Anne but then there are some other occasions when they're both so ridiculous that I can't help but smirk. Take this sentence about Sir Walter: "the rapid increase of the crow's foot about Lady Russell's temples had long been a distress to him" (pg.7). Am I the only one who finds that kind of funny? There's a passage in this chapter where I want to hug Lady Russell. Some Persuasion fans absolutely hate Lady Russell and I can kind of understand why but at least Lady Russell truly loves Anne and has her best interests at heart - which is a lot more than can be said for Sir Walter and Elizabeth. I can feel Austen's contempt here. "How dare you people be disappointed when a woman finds happiness in a new love instead of mourning her husband for the whole of her life!" "To Lady Russell, indeed, she was a most dear and highly valued god-daughter, favourite and friend. Lady Russell loved them all: but it was only in Anne that she could fancy her mother to revive again" (pg.6). Lady Russell's feelings towards Anne. I find this passage so sweet. Heidi - Oh, thank you! I'm new to the whole read-along thing and it was only after I published this post that I thought "Hang on, is it okay if I make posts of my own or is that only supposed to be the host's job?" I'm so glad you didn't mind! I won't do as many posts as yours though. I'll probably combine chapters together. Persuasion is so underrated! For some reason it seems to be one of Austen's lesser-known works but it's just wonderful! I think that Anne's mother was unhappy because she married Mr. Elliot. To anyone who is sensible and quiet, a popinjay like him would be a constant annoyance, I think. She married due to a "youthful folly," so I think of her as being basically a female version of Mr. Bennett -- married to someone she is superior to in every way, and she knows it. That was my initial thought as well but it's interesting that Austen doesn't come right out and say it don't you think?